It’s that time of year again! When you grab your friends, head on down the coast, pretend that you surf by knowing all the pros’ nicknames, and take in the action of the Quiksilver Pro and Roxy Pro being held at our very own Snapper Rocks at Rainbow Bay. Competition kicks off March 10th and can run through ‘till the 21st (depending on wave riding conditions), and is the first event on the calendar of the WSL Men’s and Women’s Championship World Tour. Spectators and pros alike agree this event is up there as one of their favourites; the waves, the crowds, the weather, and the fact most surfers will have not competed in a few months or more, adds to the allure and atmosphere. The pros themselves arrive a week or two early in an attempt to get adjusted and prepared for the contest, the conditions, and the locals! That also means they need to eat and drink, and will be floating about the Gold Coast…but where oh where can you possibly catch a glimpse, we hear you cry? Read on for seven of the best places to spot a pro during the Quiksilver Pro. This pro-spotting hotspot takes their coffee very seriously; at Bambi Deluxe there are two distinct coffee blends to choose from: a medium roast with beans from Indonesia, Columbia, PNG, and Ethiopia which is more suited to black coffees, and a medium/dark roast with beans from Sumatra as well as Indian Monsoon Malabar beans. So good is their caffeinated inspiration that pro surfers Joel Parkinson, Mick Fanning, Taylor Knox, and Stephanie Gilmore have been known to pop by, as well as others. Add to that salivate-inducing homemade cakes such as spiced carrot cake and passion fruit coming from nearby Cudgen, and your onto a winner. Who doesn’t love Currumbin? It’s a quiet oasis with a tranquil beach and lush setting that contrasts most, if not all, of the Gold Coast. Nestled just off the beach, now The Salt Mill isn’t huge, but what they are serving up here certainly is. So much so that surfers, Kelly 11-time-world-champ-Slater and Julian Wilson were spotted here together last year. Serving up delish acai and pitaya bowls, an array of homemade slices, piping hot coffee, and their very own bottled cold brew, drop in at The Salt Mill you may possibly spot a pro for yourself, if not, at least you’ll be content with the refreshing bowls and the views. You can’t get more quintessential Aussie culture than stepping through the doors of a humble surf club. Honour rolls, pictures of bygone years, trophies lining the walls, and a true sense of nostalgia fills the air, yet nowhere more so than at the Rainbow Bay SLSC. Here when competition is on, you’ll not only rub shoulders with the current pros on tour, but also past legends, and characters that make both this surf spot and the event itself such an Australian icon. The view from the balcony is second to none, and the beer is some of the coldest known to man! Pro surfers these days are a pretty healthy bunch; yoga, endless training, and of course, eating well. None more so than the king Mr. Kelly Slater himself who, at the ripe age of 44, still competes on the world stage against guys half his age. Impressive, right? Known to own an apartment nearby in Palm Beach, the surf guru and his friends have been said to frequent health food haven, Down 2 Earth Organics. Their delicious menu including acai bowls, super-smoothies, plus a host of organic grocery items will do wonders for your health, so perhaps making it high time you bought that board and started to surf yourself! Take a look at Fresh Garden Café’s Facebook page and you’ll see they’ve had an impressive collection of surfing stars drop by over the years for a Cooly Bowl or cold-pressed almond milk. While Mick Fanning’s mum is no longer the owner, the café is still a popular hotspot for pros to grab that pre or post-surf nutrition boost as well as somewhere to hang out when the waves are small or if a “lay day” has been called. 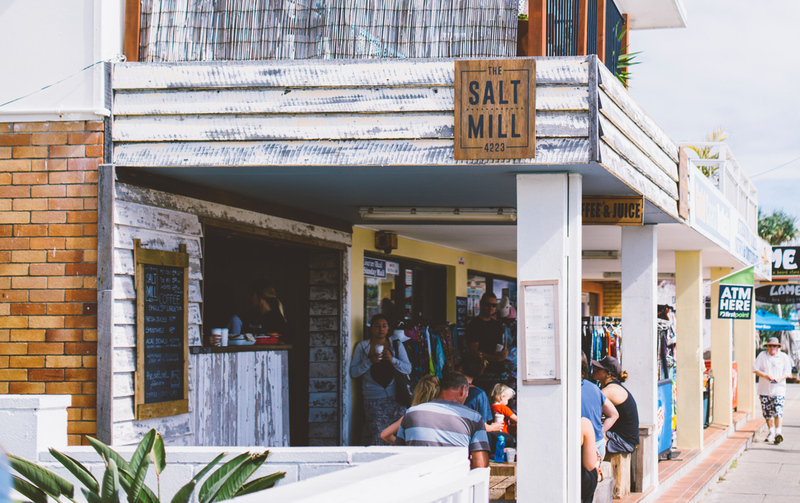 Right on the main street in the heart of Coolangatta, regardless if there’s a pro grabbing a bite or drink here, it’s still a top spot to people watch and chances are high you’ll see a pro out and about town when competition is in full swing. 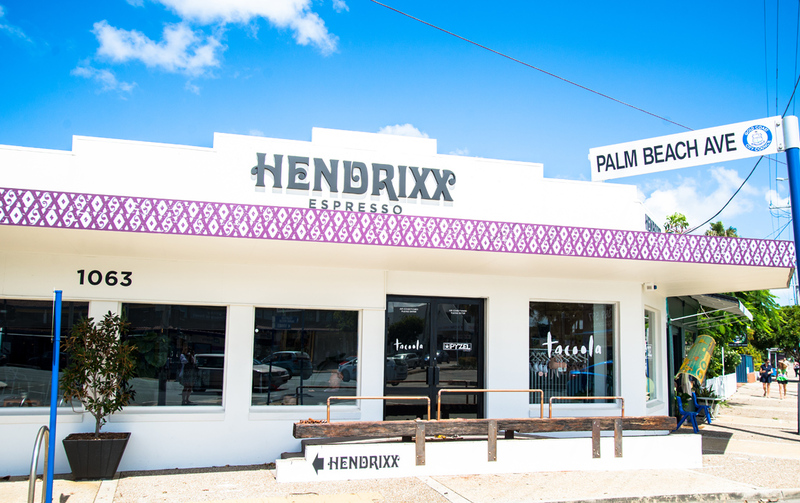 Hendrixx Espresso is a new addition to the Palm Beach café scene and is already growing quite the reputation for itself. Its setting and décor presents a cool space with a nod to the swinging 60s and the Hendrix era. Pro surfers Bede Durbidge, Mick Fanning, and surfing friends have been spotted having breakfast here. And being the “halfway house” between Burleigh Heads and Coolangatta means in the run up to competition, pro surfers will be surfing as much as possible in preparation, so Hendrixx could very well be on their post “dawny” breakfast agenda. A Gold Coast institution, Hellenika has been serving up incredible Greek cuisine and top-notch service for the past six years. At the cornerstone of the Nobby Beach dining scene, this restaurant has had its fair share of famous visitors. “Cooly kids” Joel Parkinson and Mick Fanning et al are regular customers when they feel the need to get their Greek on; but if you fail to spot a surfing pro, movie stars such as Hugh Jackman and Xavier Bardem have been spotted here. So, next time, don’t only take a big appetite but maybe your autograph book too.